Shortly after we broke the news that Brooks Brothers’ had finally released its new Auburn collection—specifically the news that the collection included a houndstooth Auburn tie—the interwebs erupted. Some liked the look but the majority of the Auburn Family deemed “Auburn houndstooth” an oxymoron, emphasis on the moron. 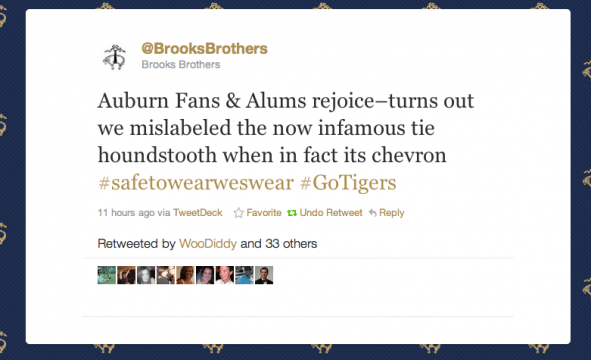 Some folks questioned Brooks’ judgment, some expressed their opinion that the Auburn houndstooth wasn’t houndstooth at all. Now we can feel good about looking good again. #GoBrooksBrothers.